High Grade Materials’ blocks are engineered for durability, functionability, and ease of installation. This retaining wall system is ideal for any commercial, residential, industrial, or water project and will add an aesthetically-pleasing appearance to any site. All blocks are available with several customizable options, such as color and size to meet your detailed architectural and aesthetic needs. Adequate equipment will be necessary for installation due to the large size and weight of the blocks. Installation quotes are available upon request. Blocks are available for delivery or scheduled pick up. High Grade Materials wall systems are great for commercial use. Due to the size and weight of our blocks, walls have the ability of being taller and stronger. 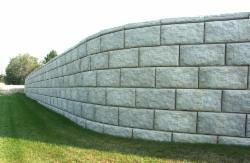 Our wall system is simple, functional, and efficient for large designs. 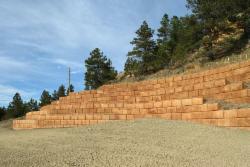 High Grade Materials’ decorative retaining wall system is ideal for all your landscaping needs. This wall system offers a unique and attractive appearance that will enhance your landscaping, and is versatile and flexible to accommodate all architectural designs. All custom blocks are available in a variety of colors. Color may be incorporated throughout the block or may be stained on the outer surface. All retail and DIY, please contact the location nearest you for sales and service. Click here for billing and accounting contact information.